Happy Rosh Hashanah! It’s the Jewish New Year 5777! Leshana Tova Tikoseiv Vesichoseim! Which means, in Hebrew: May you (immediately) be inscribed and sealed for a Good Year (and for a Good, Peaceful Life)!!!! The Hebrew New Year, Rosh Hashanah has been very meaningful in my adult life for two reasons 1) I love the Jewish culture and learning how the Old Testament Prophecies have come to pass in the New Testament and are still coming to pass today and 2) Rosh Hashanah often either coincides or happens right around mine and my daughter’s birthdays. It is a celebration and representation to me that not only am I getting older (and wiser! ), but also that I anticipate more of God’s promises coming alive in my life and for the world at the New Year. This past week I got to celebrate my birthday in California. I decided to put on my best jewelry and enjoy the day exploring Sausalito and San Francisco. It was a fabulous day! Until… we got to Presidio and I scooped up my 4-year-old into my arms just to hug him and run across the luscious lawn to explore our surroundings. And that’s when I just happened to look down. I saw the chain on my necklace had come undone… and my charm was gone. Though it is true that I could always but it online again, this realization really made me sad. It really could have been anywhere. I didn’t feel it drop. I just noticed it. This is the story of how it was found, why this is a New Year I’ll never forget, and how God cares about you in all circumstances of your life – even the difficult ones. This necklace had been given to me as an anniversary present in 2009 and had the words both in Hebrew and in English known as the Shema. The website, Judaism 101 states that the “Shema is one of only two prayers that are specifically commanded in Torah. It is the oldest fixed daily prayer in Judaism, recited morning and night since ancient times. 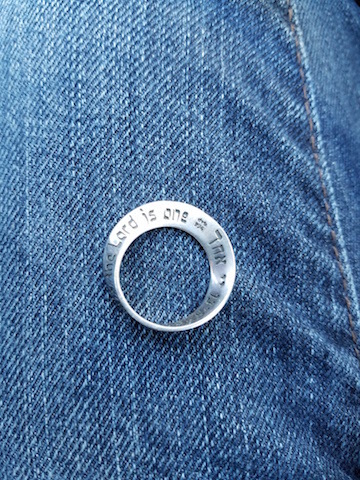 It consists of three biblical passages, two of which specifically say to speak of these things “when you lie down and when you rise up.” (jewfaq.org) My necklace states the beginning portion of Deuteronomy 6:4: “The Lord is God. The Lord is One.” I chose it to remind me that I should remember to speak the Word over my children and remember how “the Lord is God” over even the most exhausting moments of motherhood. While I am not a Jew by faith, I do consider myself as a somewhat of a Messianic Jew. I love uncovering the mysteries hidden there for the believer! So as I went back to my car and saw the necklace had not fallen there, I was discouraged, though I REFUSED to let my joy to be stolen. It was my birthday. I was in California. I was going to look forward and ask God to give me clarity regarding the lost charm. I silently prayed in the car. Suddenly, I realized that my phone had pictures of me at our previous destination WITH the necklace on. So I knew that it wasn’t there. It had to be in Presidio. We arrived at the Palace of the Fine Arts. It was gorgeous. I remembered that my husband had brought me here almost 16 years ago when we first started dating. Such marvelous architecture. As I walked around, I began to pray more. In our homeschool, we are learning about Ephesians 6, also known as “The Armor of God” chapter. I also recently joined a Bible study on the topic. Just before my arrival to California, we studied about how there are invisible wars being waged around us. Satan knows how to really bother us and there are angels fighting on our behalf. I kid you not folks, in the same way that I just happened to look down and discover my necklace was missing, I just happened to look UP… and inside the roof of the Palace of the Fine Arts were – ANGELS! I had forgotten they were there. The angels encircled the whole dome. As I began to pray, I knew in my heart that we had to go back to Presidio. Suggesting the craziness of the idea to my husband was a different idea all together. And just as I thought that… my hubby asks me if we should go back to the location where I discovered it was gone. Immediately, the whole family hopped into the car. I again prayed and prayed the whole way there and had a peace in my heart. Prayer, in my study, is described as the first piece of armor we have to use against the enemy. I was focused and determined to search. When I got out of the car, I immediately stepped onto the lawn to find the necklace. I, again, was praying. It seemed as if my prayer was almost like a metal detector leading me right to it – because in 5 minutes, THERE MY EYES SAW IT LYING ON THE GRASS!!!!! My daughter ran over and I picked her up and twirled her around how God had answered my prayers!!!! A horrible annoyance that could have ruined my birthday became a birthday I will never forget! It affirmed in my heart what my resolution is for my new year: to take back what the enermy was stolen. He tries to steal our joy. He wants you to be distracted. Not to notice the good going on in life. To be too busy to be thankful. Well… not on my watch, buddy! I am taking my life back. Will you? I will be sharing the measures I have taken to throughout the past few years, and especially 2016, to prepare to take my life back. This Rosh Hashanah, I am so thankful for a God who cares even about a lost necklace. Did he do it because I’m special? No. He did it because He cares about me and even the little things concerning my life. He did it just to show He loves me. Maybe even just to say “Happy Birthday” and that He wants a Peaceful and Good Life for me. He wants it for you, too. 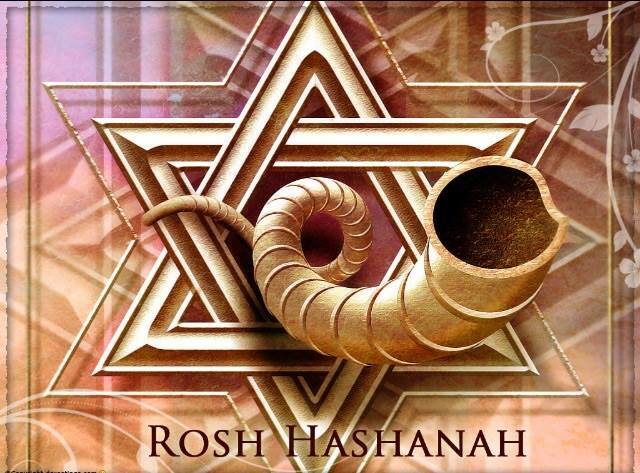 Happy Rosh Hashanah everyone! The Lord Bless you and keep you. The Lord make His face shine upon you and give to you His Shalom peace!